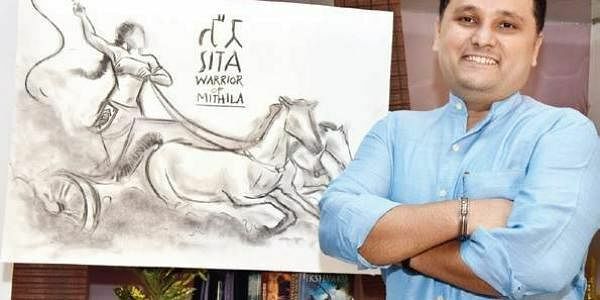 Widely popular among readers for his Shiva trilogy books, Amish Tripathi recently announced the title of his second book of Rama Chandra series. BENGALURU: Widely popular among readers for his Shiva trilogy books, Amish Tripathi recently announced the title of his second book of Rama Chandra series. In conversation with City Express, he tells us about how Sita is known to be a warrior who killed an older Ravana in one of the versions of Ramayana. His latest book Sita-Warrior of Mithila will be in bookstores by the end of May or early July this year, he informs. Why did you decide to do a series on Rama? There was an incident at a litfest a few years ago where someone had come up to me and critcised Lord Ram. In the Indian way, we are allowed to question our Gods. In Vedic Sanskrit, there is no translation of the English word blasphemy. Having said that, the kind of insulting words that individual was using for Lord Ram upset me. There are some words you should not use when talking about a God, even if you do question the God. I had written even an article at that time, saying why I respect Lord Ram. I had also decided on that day that my next work will be the Ram Chandra Series. There are a couple of books that tell the story of Ramayana from Sita’s persepective. How is yours different? How did you do your research for the book? Was understanding Sita’s character challenging? Any lesser known facts about her? I read a lot; at least four to six books per month. And I have been reading at that pace for decades. Also, I learnt a lot from my family. My grandfather was a Pandit in Kashi (Benaras). So all this is the source of my research. As far as Lady Sita is concerned, the understanding of her in modern urban India is driven by a 1980s TV serial. There are many other aspects to her. For example, in the Adbhut Ramayan, which is also credited to Valmiki ji, Lady Sita is a warrior; she is the one who kills the elder Raavan. You said the book is Sita’s story where Rama is just a character. What inspired you to write her story? I think her story needs to be told. Or rather, the ancient versions of her story need to be revived. The story where she was a warrior, a feminist. In the Indic way, following Dharma and Maryada doesn’t mean that we give up our Shakti. The Sacred Feminine has always been respected in traditional India. Perhaps this message is needed for today. Most of the current versions of Ramayana available such as the TV series portray Sita as a humble and submissive woman. How important do you think it is to also tell a story from a woman’s perspective? Most, but not all. Seeing Sita Devi as submissive is a relatively modern take on her. In the ancient versions, she is a very strong-minded woman. And I will repeat, respecting Lady Sita does not mean that we disrespect Lord Ram. We can respect both and learn from both of them. What’s your technique/process of writing a book? I am an instinctive author. I don’t make plans or flowcharts or character sketches. I just go with the flow. I discover the book while writing as much as my readers discover it while reading. Amish has invited readers to design their own cover for the book. Five winners will be selected from the entries and they will be invited on stage during the launch of the book. A few special editions of Sita - Warrior of Mithila will be given to the contest-design winners for them to share with their friends and relatives. Check out his Facebook page for futher details about the Fan Cover Art contest.